PAST support has helped fund a new booklet for the Kariandusi Museum in Kenya. The short guide was produced for the Kariandusi Museum working group, with the aid of the National Museums of Kenya, PAST and the British Academy’s Links and Mobility project. It will play an important part in giving students, educators, communities and visitors insight into life in the Rift Valley in the times of our early ancestors. Kariandusi was one of the first early archaeological sites to be discovered in East Africa, which is now famed as a cradle of human origins. The sites lie on the eastern side of the Gregory Rift Valley, about 120 km NNW of Nairobi, and about 2 km to the east side of Lake Elmenteita. 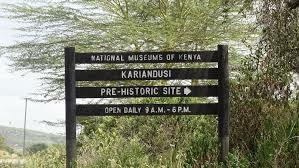 Kariandusi is possibly the first Early Stone Age Acheulean site to have been found in situ in Kenya. The diatomite deposits at Kariandusi were already known in the early years of the 20th century, but the archaeological sites were discovered only when Louis Leakey explored this part of the Rift Valley in his second expedition in 1928-29. The many handaxes and other stone tools at Kariandusi belonged to a tradition which was made for more than a million years. Its makers were certainly Homo erectus. None of their fossil remains have been found at the site, but part of a skull from Olorgesailie, to the south, and mandibles (jaws) from Kapthurin to the north, are of a similar age, and the nearest evidence of this species. Homo erectus is also well known from Lake Turkana and from Olduvai Gorge in Tanzania. The funding is part of PAST’s ongoing support for field and lab research that, like the Kariandusi booklet, is often built on international collaboration.